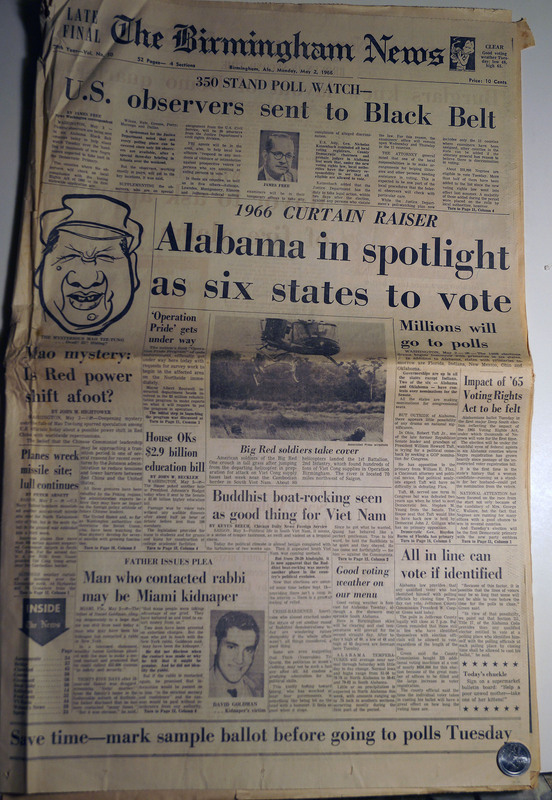 This May 2, 1966 edition of The Birmingham News has cover story of “U.S. 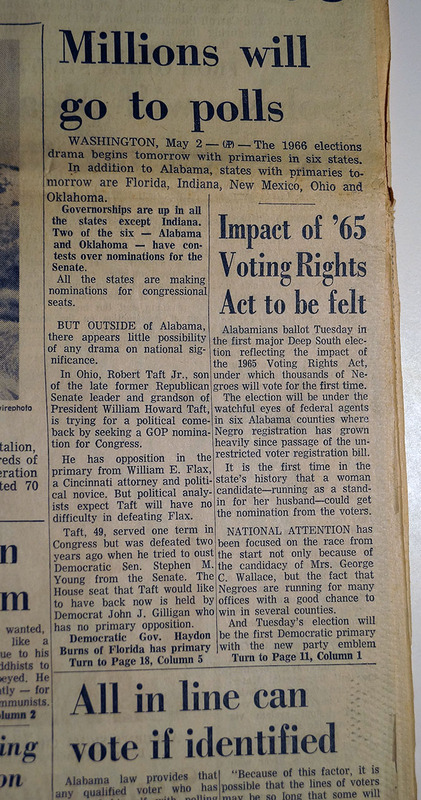 Observers Sent to Black Belt“ with the larger title on the page reading “Alabama in Spotlight As Six States to Vote.” Other cover stories: “Millions will go to polls“, “Impact of ’65 Voting Rights Act to be felt“, “All in line can vote if identified”. 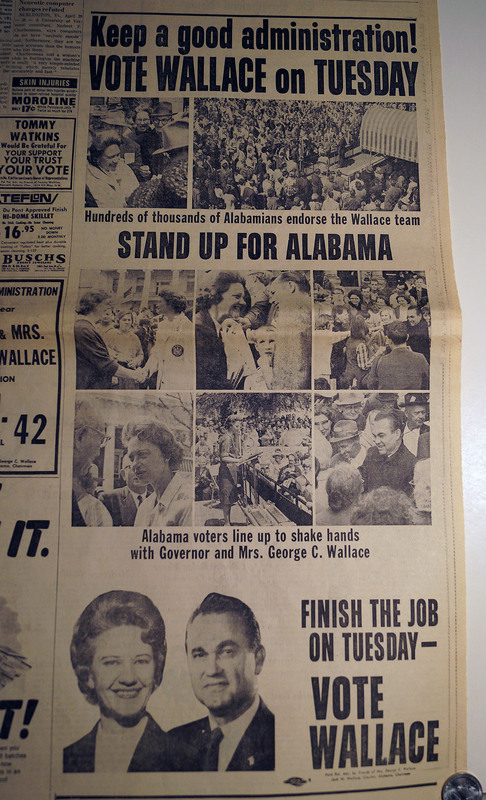 Click “Continue Reading” for full-page insert advertising Wallace for Governor. Southern states sought to disenfranchise racial minorities during and after Reconstruction. From 1868 to 1888, electoral fraud and violence throughout the South suppressed the African-American vote. From 1888 to 1908, Southern states legalized disenfranchisement by enacting Jim Crow laws; they amended their constitutions and passed legislation to impose various voting restrictions, including literacy tests, poll taxes, property-ownership requirements, moral character tests, requirements that applicants interpret a particular document, and grandfather clauses that allowed otherwise-ineligible persons to vote if their grandfathers voted (which excluded many African-Americans whose grandfathers had been ineligible). During this period, the Supreme Court generally upheld state efforts to discriminate against racial minorities. In Giles v. Harris (1903), the Court held that irrespective of the Fifteenth Amendment, the judiciary did not have the remedial power to force states to register racial minorities to vote. In the 1950s, the American Civil Rights Movement escalated pressure on the federal government to protect the voting rights of racial minorities. In 1957, Congress passed the first voting-rights legislation since Reconstruction: the Civil Rights Act of 1957. This legislation authorized the Attorney General to sue for injunctive relief on behalf of persons whose Fifteenth Amendment rights were deprived, created the Civil Rights Division within the Department of Justice to enforce civil rights through litigation, and created the Commission on Civil Rights to investigate voting rights deprivations. Further protections were enacted in the Civil Rights Act of 1960, which allowed federal courts to appoint referees to conduct voter registration in jurisdictions that engaged in voting discrimination against racial minorities. Although these acts helped empower courts to remedy violations of federal voting rights, strict legal standards made it difficult for the Department of Justice to successfully pursue litigation. For example, to win a discrimination lawsuit against a state that maintained a literacy test, the Department needed to prove that the rejected voter-registration applications of racial minorities were comparable to the accepted applications of whites. This involved comparing thousands of applications in each of the state’s counties in a process that could last months. The Department’s efforts were further hampered by resistance from local election officials, who would claim to have misplaced the voter registration records of racial minorities, remove registered racial minorities from the electoral rolls, and resign so that voter registration ceased. Moreover, the Department often needed to appeal lawsuits several times before the judiciary provided relief because many federal district court judges opposed racial minority suffrage. Thus, between 1957 and 1964, the African-American voter registration rate in the South improved only marginally despite the Department pursuing 71 voting rights lawsuits. Congress responded to rampant discrimination against racial minorities in public accommodations and government services by passing the Civil Rights Act of 1964. The Act included some voting rights protections; it required registrars to equally administer literacy tests in writing to each voter and to accept applications that contained minor errors, and it created a rebuttable presumption that persons with a sixth-grade education were sufficiently literate to vote. 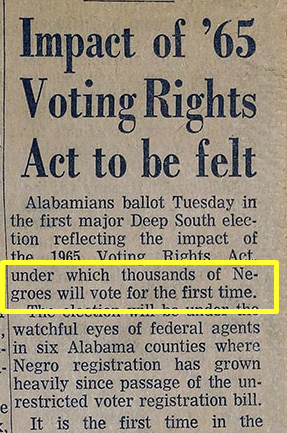 However, despite lobbying from civil rights leaders, the Act did not prohibit most forms of voting discrimination. 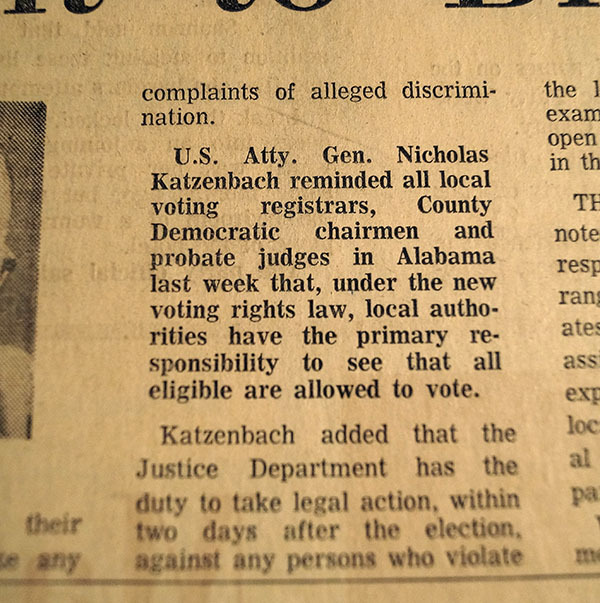 President Lyndon B. Johnson recognized this, and shortly after the 1964 elections in which Democrats gained overwhelming majorities in both chambers of Congress, he privately instructed Attorney General Nicholas Katzenbach to draft “the goddamndest, toughest voting rights act that you can”. However, Johnson did not publicly push for the legislation at the time; his advisers warned him of political costs for vigorously pursuing a voting rights bill so soon after Congress had passed the Civil Rights Act of 1964, and Johnson was concerned that championing voting rights would endanger his Great Society reforms by angering Southern Democrats in Congress. Following the 1964 elections, civil rights organizations such as the Southern Christian Leadership Conference (SCLC) and the Student Nonviolent Coordinating Committee (SNCC) pushed for federal action to protect the voting rights of racial minorities. Their efforts culminated in protests in Alabama, particularly in the city of Selma, where Sheriff Jim Clark’s police force violently resisted African-American voter registration efforts.